As an author, visiting schools can be a rewarding and fun way to inspire your minds. A successful author visit is one in which the students, staff and author all enjoy themselves. Having done a few of these visits myself, I've come up with a list of those things that I have found that will help make sure that you end up delivering a successful author visit. School staff work hard - really hard. They are the ones doing all the organisation ahead of time and they do this whilst doing their day-job at the same time. Anything you can do as an author to make their lives easier will make them love you. This could mean providing them with artwork to help promote the event, or bringing hand-outs for the students, etc. The less work the staff have to do to prepare for the visit, the more willing their will be as participants and the more enthusiasm they will bring to the table. If your visit to their school results in them having to do lots of additional work, you may find that the visit simply doesn't happen at all. School children can be incredibly interactive so prepare some fun activities for them to get involved with and they'll love you for it. Get them up and about and/or doing something that will keep their interest. Your visit will typically take around an hour and keeping a room full of fidgeting 10-year-olds just sitting still and attentive for that length of time will be incredibly challenging. Anything you can do that will encourage them to interact with you or with each other will work to your favour. A fun activity that I like to use is the guess the animal competition. There are a number of magical animals that are illustrated in my book and I have them all printed on large cards. I also have the animal names printed on separate cards. I invite ten students to the front of the group (just asking for volunteers already gets them excited) to hold up these illustration cards and then I choose a child at random to try to guess which animal name goes with each animal. We go through them all one-by-one until all the names are correctly matched. It's incredibly fun and the kids always seems to really enjoy it. Another fun activity I like to do is a themed wordsearch puzzle, which I provide to the school staff and students ahead of time. When all the hidden words are found, the unused letters form a hidden phrase. All students that provide a correctly completed wordsearch puzzle with the correct hidden phrase revealed go into the hat for a free, autographed copy of my book on the day. Not only is this a great opportunity to interact with the kids but it also doubles up as a way to get them excited ahead of the visit. All children like to receive free gifts from the author. At the very least, you should bring one or more of your books to give away - perhaps make that something special that you give away at the every end of your visit. Another perennial favourite are bookmarks. I have thousands of them and I give these away copiously during my visits. Every student present receives at least one and I give them away at various points during my presentations. You could also bring other books of the same genre of yours to give away, or it could be branded merchandise to do with your book or series, etc. Whatever it is, kids love to receive free stuff and will reward you with enthusiastic participation as a result. Kids are, well let's face it, kids. During a typical author visit, you may encounter the full range of behaviours, from sitting attentively on the floor to unruly and disruptive. Some kids are just naturally hyper. There's nothing wrong with this but you can manage it effectively. How you deal with this will very much come down to how well you are with kids in general and how much presence you bring into the room with you. If you are timid and quiet, you may find it difficult to maintain control. If you are confident and interesting, however, you'll have more luck. The staff in attendance are your friends in this regard, so make sure you're on the same page with them regarding how to deal with unruly children. There are several tricks that you can use to encourage good behaviour. I sometimes tell the kids that I have a quiet voice and that they can help me by keeping quite when I'm talking. Another favourite of mine is to reward good behaviour by giving away free stuff, like bookmarks, or perhaps choosing volunteers from the best behaved. Sometimes, however, the best defence is a good offence and I deliberately single out the louder children to come up and help me. It gives them something do to that's positive and constructive, as opposed to treating them as a nuisance to be avoided. It's very important, however, to never treat the children in a condescending way. Kids are smarter than you think. I remember one occasion when a child was sitting next to my chair whilst I was doing a reading of a chapter. He had a piece of paper that he was fidgeting with and it was noisy and distracting. Rather than admonish him, I simply carried on reading but slowly reached down and gently took the paper from him. At the end of the reading, I slipped the paper back to him again. I didn't even need to make eye-contact and the reading went on undisturbed. You're visiting these children to talk to them about being an author, right? Use this to your advantage and play to your strengths. You can tell them about the various aspects of the writing process, about how publishing works, what the editing process looks like, how you get your cover art, where and when you like to write, and all the other things that you're already intimately familiar with. It's much easier to talk to a group about something you know and are comfortable with - which be definition is writing, right? Remember that what seems mundane and ordinary to you may be absolutely fascinating to others, so don't be afraid to explore all of this with the students. Things can and will on occasion go wrong. Your laptop may run out of power; the audio system might not work correctly; you might forget to bring something important. Whatever it is, it's a good idea to be prepared for every contingency. If at all possible, meet with the staff ahead of time. Discuss with them the venue and any contingency plans. Get to the school early and make sure you have plenty of time to set up anything you need. Have a back-up plan ready to go. Prepare an activity that you can fall back on if you need to. You won't be able to plan for every contingency but the more you think about what could possibly go wrong, the better you will be prepared to deal with it. Remember, these children will be looking up to you, so how you deal with any adversity on the day will resonate with them. Probably the single biggest thing I can recommend for a successful author visit is simply to have fun. If you have fun doing it, the kids will have fun with you, and you will come out the other end with a great sense of achievement. It will also leave the kids with a buzz that, hopefully, will inspire them to go and do some creative writing themselves. Maybe they'll also be encouraged to go out and buy your book, or convince their parents to do so on their behalf. Having done a few of these author visits myself, I tend to measure success in the feedback I get from kids at the end of the visit. Nothing says successful author visit more than hoards of kids queuing up to get you to autograph their copy of your book, their diary, backpack, back of hand, etc. Great post I love numbers, 3, 6 and 7, can’t do school visits without them. I do quite a few myself but may be at an advantage as a retired, after 42 years teacher. I love doing them. Thanks for your comments, Neil. 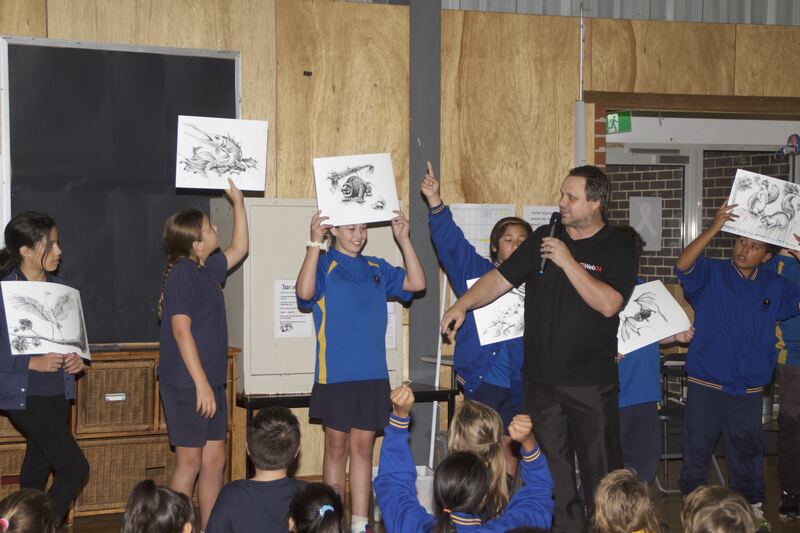 I have found doing these school author visits to be incredibly rewarding and really enjoy the high-energy approach. Kids come away from my sessions absolutely buzzing with excitement 🙂 As someone that’s done these yourself, what other things might you add to this list? Do you think that having a background in teaching changes significantly your approach to doing these?